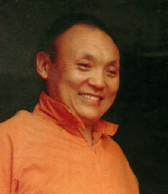 Khamtrul Rinpoche Dongyü Nyima (1931-1980) (Tib. ཁམས་སྤྲུལ་རིན་པོ་ཆེ་དོན་བརྒྱུད་ཉི་མ་, Wyl. khams sprul rin po che don brgyud nyi ma), the Eighth Khamtrul Rinpoche, was an important master of the Drukpa Kagyü lineage—the eighth reincarnation of Khampa Karma Tenphel. He rebuilt Khampagar Monastery in Tashi Jong, Himachal Pradesh, India, in the late 1960s and played a leading role in reviving the Drukpa Kagyü lineage in exile. The Ninth Khamtrul Rinpoche Jigme Pema Nyinjadh (b.1981) who currently resides in Bhutan. This page was last edited on 11 February 2018, at 07:01.